I discovered Popchips, the healthy potato chip alternative, while flying home from a business trip, and for awhile after that, I regularly purchased them at the grocery store. Untraditional as it may be, the airplane is one way I routinely discover new snack foods. Another trendy way is subscription commerce, which gets consumers to sign up for a monthly box that comes loaded with a handful of products for a fee. The business model has been applied to an exhaustive list of categories: Makeup, coffee, food, kids’ toys and crafts (check out subscriptionboxes.com to get even more ideas). Now Walmart is experimenting with the concept, too. Today it launches Goodies Co., a monthly service that will send you a package of sweets and snacks for $7, including shipping. The twist on this particular offering is something that the megaretailer does best — pricing things unbelievably low. Other services charge anywhere from $12 to $30. For instance, the Knoshbox, aimed at foodies, costs $30; Love With Food offers a monthly rate of $12; and Sprig offers a mini-snack plan of 10 to 13 items for $26.95. Goodies, which is coming out of beta today, is being run entirely by @WalmartLabs, Walmart’s tech team in San Bruno, Calif. While it continues in the experiment phase (as evidenced by not using the Walmart brand yet), the employees at @WalmartLabs will curate and source the brands — even though Walmart stores represent the largest grocer in the country. 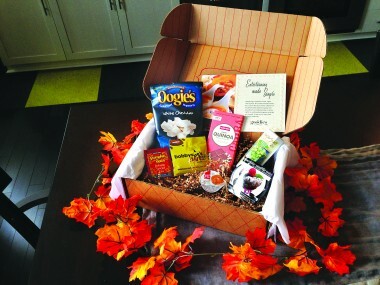 For example, the October Goodies box came loaded with a number of items, including a single-serving fruit snack, a delectable snack pack of Nutella spread with dipping sticks, and some more oddball items, like coconut-flavored chips and crunchy brownies that tasted like Oreos. Raj said that the box, which will have six to eight items every month, is actually worth closer to $15, or double what they are charging. Goodies also has a marketplace, like most subscription services, where consumers can come back to order. It also has a social community, where subscribers can post reviews to earn loyalty points. The points will be redeemable for free boxes or to buy items in the marketplace in the future. Subscribers can also upload pictures or share recipes.